ALUTEC boxes are open for everything: Elegant and sturdy, light and easy to carry, in various sizes – a solution for all your storage needs! 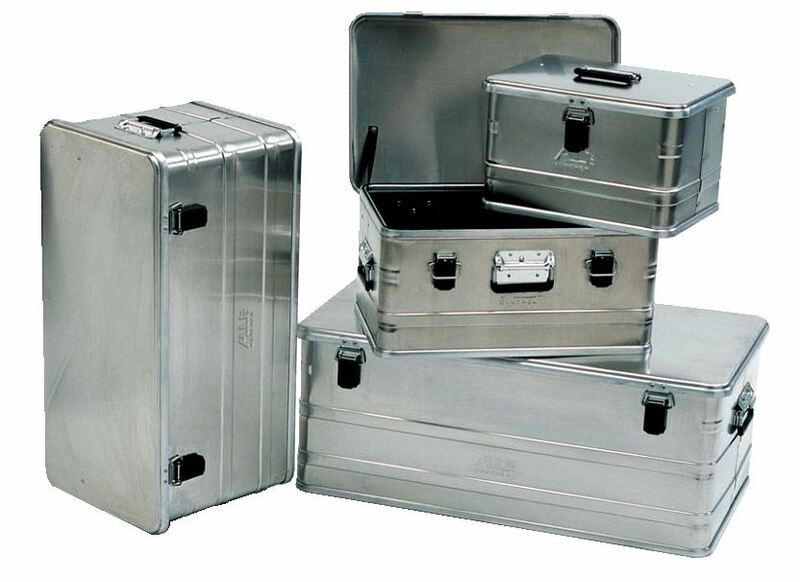 The ALUTEC boxes are weather proof and temperature resistant, and, as they are made of aluminium, they are well protected against corrosion. Sturdy profiles (sheet thickness is 1.0 mm) and corrugated structures provide high stability and help to prevent damage to your contents. On the move, the ALUTEC boxes convince by their lightweight design and comfortable safety handles. Whether at home or away, on a plane or in the workshop –, your sensitive photography and astronomy equipment is stored safely in ALUTEC boxes! Comfortable, plastic-coated, self-folding safety handles allow for easy transport. Two retaining straps fixed to lid and body prevent the hinges from being damaged. A continuous rubber gasket protects your precious goods from environmental influences such as water, dust, or odors. For space saving storage in small places, the D series comes equipped with four stacking corners. Available in nine different sizes from 29 to 415 liters volume. The top and bottom of types D 163 and D 415 are reinforced with waterproof plywood.